MORRISVILLE (WTVD) -- Wet roads created hazardous driving conditions for commuters Monday morning, causing several accidents. READ MORE: Raindrops moving out, snowflakes moving in? Police are encouraging drivers to take is slow after a GoTriangle bus hydroplaned off of Slater Road in Morrisville. 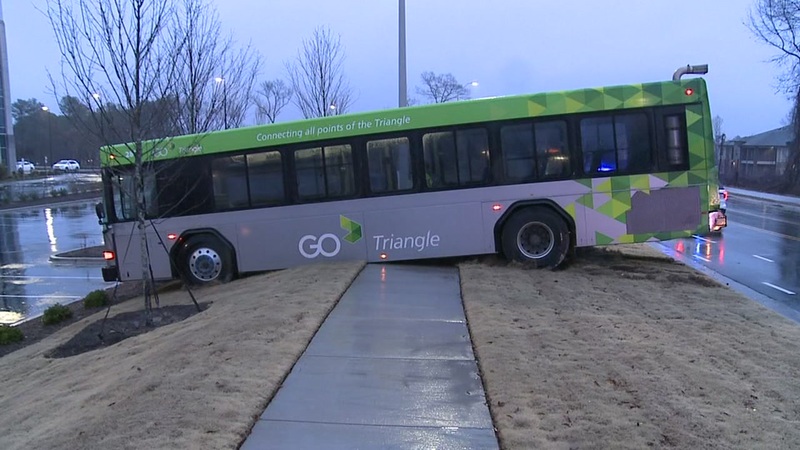 Officers said the incident happened just before 7 a.m.
Reports show the GoTriangle bus skidded off of Slater Road and landed on a crosswalk. Officers said no one was injured during the incident; however, the bus did sustain minor damage.